The revolutionary Bobble bottle is the latest on pure, filtered water. A reusable bottle, the Bobble not only looks to reduce carbon footprint but also make filtered water easily accessible to the people for a low cost but how does it work? The Bobble filter uses activated carbon to remove chemicals from water. Carbon is proven to be a powerful chemical absorbent which draws out contaminants and ensures water is clean and safe to drink. The bottle itself is made from recycled PET that is free from BPA, Phthalates and PVC. What’s more, it is 100% recyclable so that every consumer that buys a Bobble bottle is making their contribution towards a greener planet. Bobble filters are removable and replaceable. Each filter equates to 150 litres of water or 300 plastic bottles. 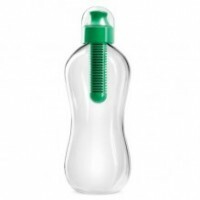 Using the Bobble is simple, simply fill it with water and as you drink the water will be filtered. The Bobble bottle is readily available at EcoHip.co.uk in an eclectic range of colours. The chic design makes the Bobble an attractive alternative to the not so eco-friendly bottled water and it is available for just £10.99. Buying bottled water will become a thing of the past as water is cleaned through the replaceable Bobble filter. Find out more about the Bobble bottle by clicking here. I see your site needs some unique & fresh content. Writing manually is time consuming, there is tool for this task. Great post, Keren. I have always found that talking about writing and teaching others makes you re evaluate your own writing. It is exciting to see what great ideas people have and to watch their joy when they discover they can craft a piece of writing and produce sotiehmng they never thought they were capable of.I feel for the lady who never came back but perhaps she just realised it was not for her or it might have surprised her how much hard work goes into writing! In all honesty, I think Lunar’s blog was a much more objective than ScmF.’spaor example, Lunar had no problems in expressing his thoughts on that ASDA new campaign just out from your Fallon heroes, Scamp. Turkey of the week for sure. But you only seem to see one side of the story, mate.For that I’ll miss him. Thank you for a very informative site. What else could I get that type of information written in such a perfect way? Didn’t know the forum rules allowed such briinlalt posts. I just want to mention I’m all new to blogging and actually savored you’re web-site. Likely I’m want to bookmark your blog . You certainly have exceptional article content. Kudos for revealing your webpage. Thank you so much for giving everyone a very splendid opportunity to discover important secrets from here. It really is so beneficial plus full of a great time for me and my office co-workers to search the blog the equivalent of 3 times in 7 days to read the newest tips you have. And lastly, I’m so always satisfied for the very good points you give. Certain 4 ideas in this article are unquestionably the most suitable we have had. I just want to mention I’m beginner to blogs and certainly liked your web-site. Very likely I’m planning to bookmark your website . You absolutely come with impressive articles and reviews. Thanks a lot for sharing with us your blog. I comment each time I appreciate a article on a website or if I have something to valuable to contribute to the discussion. Usually it’s caused by the sincerness displayed in the article I read. And after this post. I was actually excited enough to create a comment 😉 I do have a few questions for you if it’s okay. Is it just me or does it look as if like some of the remarks come across like they are coming from brain dead people? 😛 And, if you are writing at other social sites, I would like to follow everything fresh you have to post. Would you make a list the complete urls of all your public pages like your twitter feed, Facebook page or linkedin profile? If some one needs to be updated with latest technologies therefore he must be visit this web site and be up to date everyday. It’s always exciting to read articles from other authors and practice a little something from their sites. Ahaa, its good conversation on the topic of this paragraph at this place at this blog, I have read all that, so now me also commenting here. visiting this web site dailly and get fastidious information from here everyday. I constantly emailed this blog post page to all my friends, for the reason that if like to read it after that my contacts will too. just sum it up what you had written and say, I’m thoroughly enjoying . I too am an aspiring blog blogger but I’m still new to the whole thing. I stumbled upon your blog by chance and I am very happy with this discovery. Your articles are very informative and inspiring. Thank you very much for your hard work !